1- I need to create a perpendicular line to connect multiple points to multiple lines but these lines have to follow a sequence of column. 2- And these perpendicular lines can't be created of differents "id's". In the image above, you can see the result (In red) that i want. The (Red Line) has to start on the point and connect to the "line.shp" (following column "MDE" from lowest to highest) creating a perpendicular line. Browse other questions tagged qgis point line perpendicular or ask your own question. 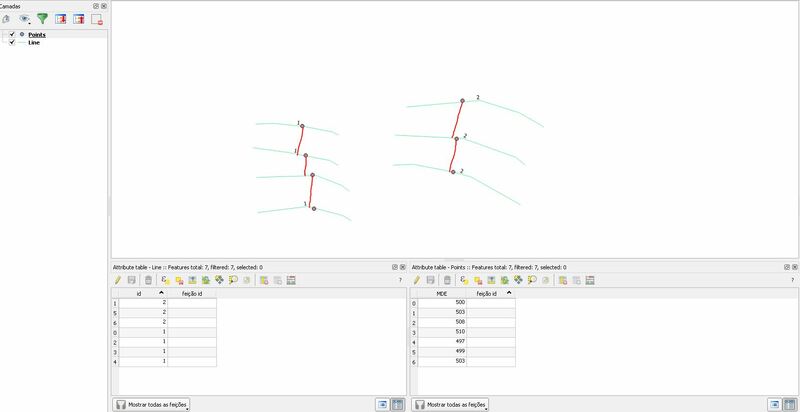 Connecting centroids of lines sharing same intersection in QGIS? Calculate distance from all points to all lines within 10km using FME? Connecting two points in ArcGIS for Desktop? Generating line offset, perpendicular using PostGIS? Inserting line along line using ArcPy? How to convert several 'point' data to 'line' data?